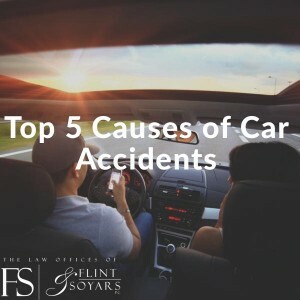 Top 5 Causes of Car Accidents | The Law Offices of Flint & Soyars, P.C. Distracted driving– This reason wasn’t always this high on the list, but with the rise of cellphones and texting, distracted driving now accounts for 25-40% of accidents. It’s not just cell phones, talking to passengers, changing the radio, doing makeup in the mirror and other distractions all contribute to this. Drunk driving– Studies show that roughly 32% of accidents result from drunk driving. This is also one of the leading causes of car accident fatalities. Speeding– Like drunk driving, this is also a leading cause of fatal car accidents. Obviously, the faster the cars are going, the more serious the damage and injury will most likely be. When speeding is involved, the accident is rarely considered a minor accident. Weather– One cause of accidents that isn’t directly the driver’s responsibility is bad weather. Rain, ice, fog, winds, snow and other inclement weather all increase the chances for an accident. Car failure– This doesn’t cause as many accidents as the other reasons, but car failure can cause accidents if the conditions are right. Car failure can be a tire blow out, breaks not working, or batteries dieing. If you’ve been injured in a car accident for any of these five reasons or any other reason in Texarkana, call “Texarkana car Accident Lawyers ” The Law Offices of Flint & Soyars.